It's official: Ico and Shadow of the Colossus will soon be bundled together and released in HD. After rumors and a Walmart listing clued us in that a Team Ico PlayStation 3 collection was on the way, it's now been officially revealed by Famitsu magazine in Japan. It's not like we didn't know this day was coming, but it's nice now that it's here. 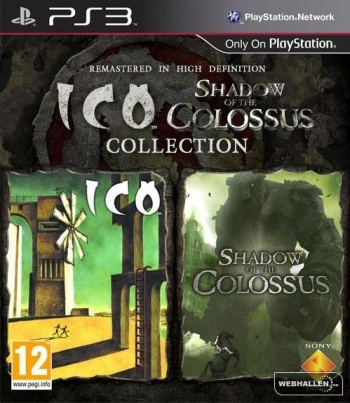 The collection will contain Team Ico's first two games, the PlayStation 2's Ico and Shadow of the Colossus, upgraded with HD graphics. They're both awesome pieces of work, and often cited in the "games as art" argument, though Ico became pretty hard to get and gained most of its following after it was already out of print. Shadow of the Colossus is still readily available, but it'll be great to check out its massive colossi in HD. The game's boxart also leaked out of a Swedish retailer earlier today. Information about further additions to the games, such as Trophy support seen in the God of War Collection, hasn't come out yet. In Japan, the games will be released separately, but they'll stay together in other regions. More news about the collection will likely be revealed at this week's Tokyo Game Show. Thanks for the tip Jack and Calumon!